While in between semesters at Lindenwood University, Howard fit in his second pro MMA fight Saturday at Shamrock FC 314 at the Ameristar Casino. In the evening's co-main event, Howard won by unanimous decision over Nashville's Nathan Lindsay to improve to 2-0. "When I go to school here I can walk to the Ameristar from my house," Howard said. "I have a lot of friends from school out here, our martial arts school in O'Fallon, our Tae Kwon Do school, all of our families are out here supporting me and it felt great to get a win for them in front of my hometown crowd." Howard is due back on campus on Monday, but on Saturday his high-powered offense set a heavy pace and Lindsay (1-1) tried valiantly to keep up and mount some sort of attack but could never get the ball rolling. Coming off a more pragmatic second round, in the third Howards' offense revved up again with his hand speed getting the better of Lindsay. He mixed and matched punches, like the lead uppercut, and leg kicks effortlessly. Around the 90 second mark. Howard took the back and had several dominant positions on top. In the second, an early takedown by Howard led to maintaining dominant position, defending submission attempts, before making it to side control. Howard played top game for the bulk of the round and fended off several offense attempts from Lindsay of his the back. Howard was able to land some significant ground and pound punches down the stretch. It was a highlight -reel worthy first round for Howard, the St. Charles MMA flyweight showcased all sorts of attacks and all the credit in the world goes to Lindsay for his durability. "Definitely my toughest fight to date," Howard said. "It felt good to go three, five-minute rounds. We go those lengths in training but with the crowd here and the bright lights, it's a lot different." Snow may have soaked the streets, but that didn't slow the action. 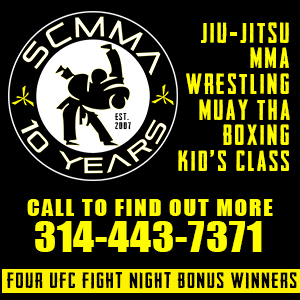 The pro/am kickboxing and mixed martial arts event was headlined by SFC's first-ever pro kickboxing bout held inside a MMA cage. St. Louis veteran Kevin Engel welcomed a skilled and talented newcomer to the pro kickboxing ranks. Shah Zolfagnari, out of the highly-reputable Chicago Muay Tai Kickboxing Club, got the better of Engel in two different exchanges early in the first round. Zolfagnari sat Engel down near the 2:25 mark and followed with more pressure and landed heavy punches to get the KO soon after. In MMA, bantamweight Dustin Lampros faced Jeremy Rogers. At the opening bell Rogers pressed the action to the fence before Lampros reversed positions. Lampros shrugged Rogers to the floor and from there landed a handful of defenseless shots to a turtled Rogers and got the stop at 1:20 in the first round by TKO. Lampros out of Finney's MMA improves to 3-0, and once again greeted to a loud ovation by the Ameristar crowd. In little over 90 seconds, Colin Parr improved to 2-0 as a pro. A crafty sweep got Parr, from Watson Martial Arts, out of trouble early and from there it was controlling and methodical. Parr hung out inside control before advancing to the back with plenty of time left. From there, he pounded away to a defenseless Petty and earned his second career pro win with a TKO at 1:38 in round one. Two local lightweights made their pro debut and St. Peter's Brandon Pearson made it a short night against Warrenton's Kevin Mueller. Pearson closed the distance and tagged Mueller with a shot to the body and then swarmed to get the TKO in just 19 seconds. An anticipated bout between SFC amateur bantamweight champ Tim Jackson and Travis Sumler was scrapped due to weather conditions impossible for Sumler to travel. Look for the bout to be rescheduled for an upcoming SFC event. Keyth Dawson did a nice job of finding his range and overall speed. "The Sleeper" Dawson with an upset win over the previously unbeaten Dan Herina for a Shamrock FC amateur kickboxing title. Forty-three-year-old Jason Gavril, aptly nicknamed the "Silver Fox," was one of the highlights of the undercard in his win over Cody Leas. From mount, Gavril chased after a submission late in the first round. Gavril worked a kimura but Leas did an admirable job fending it off. Late in the second round, Gavril, fighting out of Raven's Ridge MMA in Shrewsbury, found himself with a head-and-arm choke in place and this time he didn't let the opportunity slip, as he put the squeeze on to get the tap. "It's about the experience," Garvill said. "I just want something in my life to look back on and have something I did that I can leave behind. Nothing wrong with saying my dad was a truck driver, and I'm proud of that. To be able to do something that only a half a percent of people do is an amazing experience. I've got some great guys with me on the journey, but yeah it's amazing." Arnold BJJ's Brandon Breault won a spirited contest with Jason Brown in amateur kickboxing by unanimous decision. Jeff Rittenhouse representing Finney's MMA earned a first-round TKO Zachary Burcham. The stoppage came with just five seconds left in the round. Joe Rivas won by TKO early in the second round over Jimmy Timmerberg in a kickboxing match-up. In the night's only women's MMA bout, Adrienne Brusca earned split decision win over Lyz Anderson in the evening's opener. Shamrock FC is back at Ameristar STC on July 13th, and returns to action on February 2nd in Kansas City. Stay tuned for more information on these events.